I'm linking up with Jill of Forever N Ever N Always as we continue to study Ann Spangler's book "Praying the Names of God". 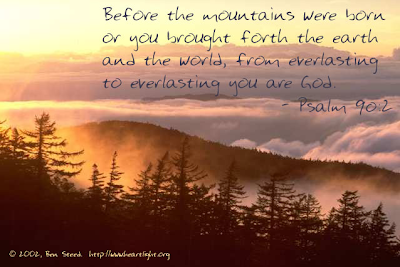 This week our focus is on God as the Everlasting God or the Eternal God; El Olam. El Olam is a Hebrew name for God that tells us God has no beginning or end. He is everlasting. His Son is called the Alpha and Omega. His love endures forever. After the treaty had been made at Beersheba, Abimelech and Phicol the commander of his forces returned to the land of the Philistines. Abraham planted a tamarisk tree in Beersheba, and there he called upon the name of the LORD, the Eternal God. I read the earlier portion of Genesis 21 and noted that in verse 22 Abimelech and Phicol said to Abraham, "God is with you in everything you do". This passage tells me that Abraham was living out his faith in front of others. He didn't hide the fact that he worshiped God. The people living in that area probably observed Abraham worship God. Even Abimelech, who was the leader of the Philistines, heard about Abraham's God. They also noticed the outcome of his faith in God. God was with Abraham in everything he did. The same God who was faithful to Abraham is the same God that I worship. He is faithful to me too. His love endures forever. I pray that I would live out my faith in front of others and that they could see how God is in everything I do. I know that my part is to ...trust and obey. It's easy for me to gather with like minded people and worship and praise God in church on Sunday. But during the week in my daily life I have to ask myself if others see that God is with me in everything I do? The Scripture also said that Abraham planted a tamarisk tree in Beersheba. I guess he was planning on staying awhile. He continued to call upon the name of the LORD, the Eternal God. Lord, your love and faithfulness endure forever. Help me to live my daily life with the strength that comes from knowing that I am going to live with you forever. The God who was with Abraham is also with me. God is eternal, everlasting, forever. I KNOW a lot of Scripture. Head knowledge is one thing but heart knowledge is another. I desire heart knowledge so I will live out the Truth every day and apply what I learn and know to be true. I choose to place my trust in God. He is El Olam. He is the same God who was faithful to Abraham. He always keeps His promises. Thanks for joining me and walking out what it looks like to trust and obey Him at all cost! This is a great way to begin the week Debbie. 'El Olam'... Alpha and Omega, Beginning & end... one more reminder of what a God we serve and how thankful I am to belong to Him! Have a great week... praying for all that is ahead! My exact question and prayer lately, do people know God in me....see God in me.....REALLY? In my "daily life"??? Somehow your sentiments once again my sentiments Debbie. I am so relieved to know that God is in EVERYthing in my life...once again making me want to have Him SEEN in my everyday life. I feel like the pencil I just sharpened, it's a daily thing. Thanks once more for your heart-words. I love your confession of faith! Knowing what a rugged stretch of road you're traveling, it would be so easy to confess unbelief. Yet here you are, praising the God who has you squarely in His scope; His eye & purposes for you so good; so very, very good! Again, good word, great reminder!! Just for the record, dear woman, I see God in you and love your determination to draw closer in perilous times. Moving knowledge from my head to my heart is the hardest part. It is during the trials and difficulties that this is worked out. 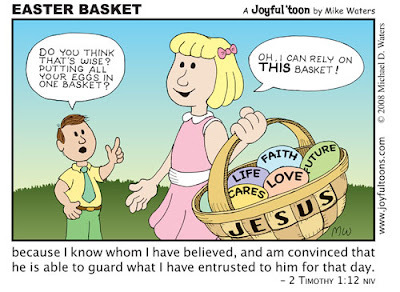 I'm so glad He is always faithful!!! Beautiful Debbie. Amen, He is faithful and I'm sure everyone sees Jesus in you my friend! Love this, Debbie! So thankful for our Faithful God and Daddy!! !